On July 4, the Office of Research Affairs and the SNU Research and Development Business (R&DB) Foundation, led by Professor Kim Seong-Cheol of the College of Engineering, hosted the opening of SNU’s Creative Factory, a creative space for prospective entrepreneurs to cultivate, discuss, and receive mentoring and consulting on their business ideas. Along with Professor Kim, SNU President Sung Nak-In and other SNU officials were present at the ceremony. 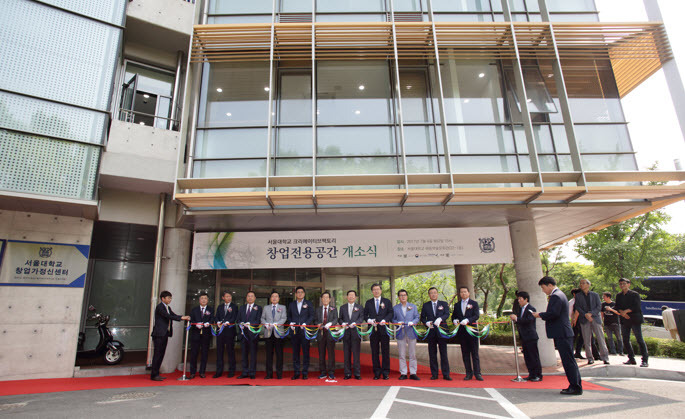 Since November 2016, the SNU R&DB Foundation – the organization responsible for the overall planning and management of research funds and research output - has been working in collaboration with the Korea Institute of Startup &Entrepreneurship Development in order to support new businesses. The Creative Factory aims to take the innovative ideas of these talented individuals and facilitate the process of making those ideas into reality. The Office of Research Affairs and the SNU R&DB Foundation has dedicated a space at the Haedong Science &Culture Center located in the College of Engineering for beginner entrepreneurs to come and discuss ideas for their businesses in terms of location, products, and innovating new ideas. The Creative Factory will take hopeful business owners through a four-stage process: brainstorming, designing the product, developing the product, and releasing it into the market.